Tom Hartwig is at it again. What can we learn about life, love and artillery from an 82-year-old man whose favorite hobby is firing his homemade cannons? Visit by visit – often with his young daughters in tow – author Michael Perry is about to find out. Toiling in a shop Perry describes as “an antique store stocked by Rube Goldberg, curated by Hunter Thompson, and rearranged by a small earthquake,” Tom Hartwig makes gag shovel handles, parts for quarter-million-dollar farm equipment, and—now and then—batches of potentially “extralegal” explosives. Famous for driving a team of oxen in local parades and approaching his 60th marriage anniversary with his wife Arlene, Tom has an endless reservoir of stories dating back to days of his prize Model A, and an antiauthoritarian streak refreshed daily by the four-lane interstate that was shoved through his front yard in 1965 and now dumps over 8 million vehicles past his kitchen window every year. 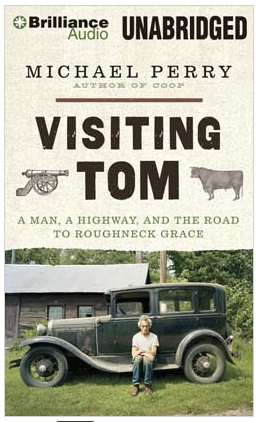 And yet Visiting Tom is dominated by the elderly man’s equanimity and ultimately—when he and Perry converse over the kitchen table as husbands and the fathers of daughters—unvarnished tenderness.